Willow-herb Clarkia (Clarkia epilobioides), is an annual herb that is native to California and is a species of flowering plant in the evening primrose family. 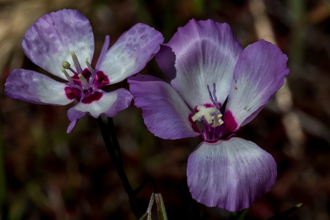 The Santa Monica Moutains have several varieties of Clarkia plants: Elegant Clarkia, Farewell-to-Spring,Purple Speckled and Large Godetia. 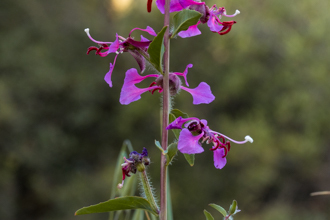 Willow-Herb Clarkia can be found in the following plant communities: coastal sage scrub, oak woodland, chaparral and desert in generally shady places below 2,500'. A slender, erect stem one to two feet in height produces some tiny white flowers with four petals. 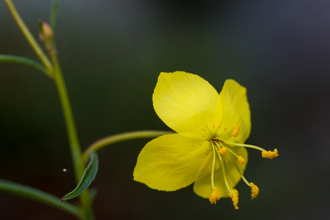 If you look closely you will find eight stamens and a white to cream-colored stigma shaped like a plus. 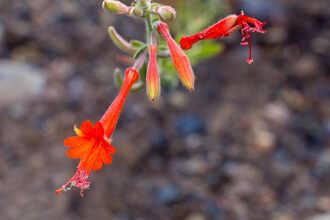 Each nodding bud has four red sepals that remain fused together or in pairs as the petals emerge during blooming. The petals are one half to one centimeter long, oval in shape, solid white or cream in color, often fading pink as they age. 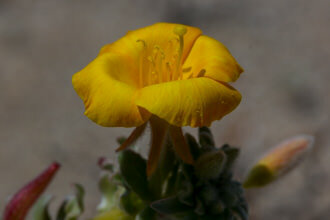 Name Origin found on Calfora.net a wonderful site for native plant information as well. Last modified: March 31 2017 21:27:09.